Are you still swimming in summer zucchini from your garden? (I totally am.) 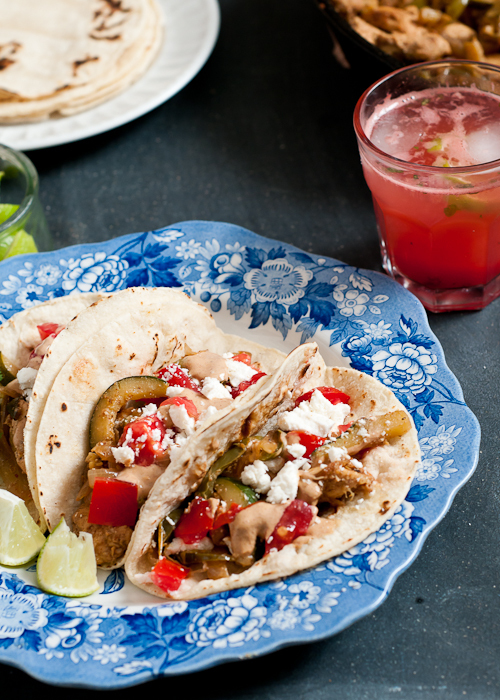 These fajitas are another great way to use up all of that zucchini. So here’s the thing–my husband doesn’t care for Mexican food very much. (I still married him.) But he loved these. My kids loved them. I sat back and watch them eat them up. And then a few days later I made them again and the same thing happened. That’s the sign of a good family dinner everyone can enjoy, am I right? My favorite part was the chipotle crema. I’m a sucker for a good sauce, what can I say? A friend of mine that used to live across the street from me, introduced me to Bufalo Chipotle hot sauce. She and her husband are some of the best cooks I know and I loved being invited to their house for dinner. He lived in Mexico for a few years, so as you can imagine, his Mexican food was outrageously good. They mixed a little of the chipotle sauce with Crema Mexicana and I was immediately smitten. You’ll never go back to plain crema once you try it. Okay, so dinner is all taken care of. 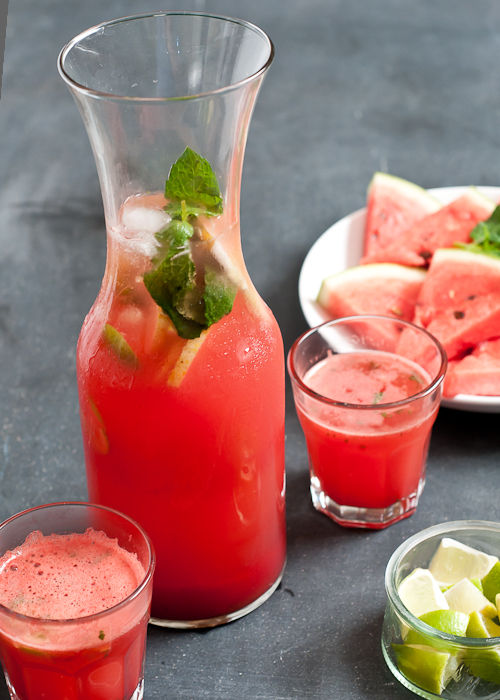 Now remember that minty watermelon cucumber cooler from last week? Yeah. It goes great with these fajitas. This recipe makes a lot, which is great because you’re going to want plenty of leftovers. One night of cooking for two nights worth of dinner. Either that, or invite all of your friends over and bask in their praise. 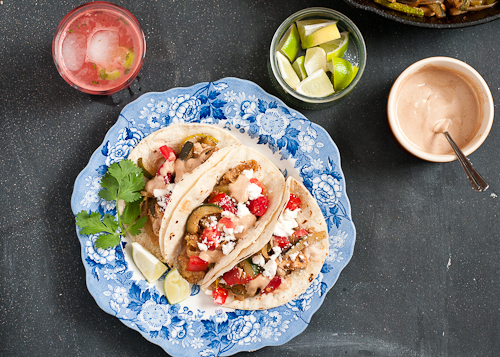 ‘Cause you’ll be their new favorite, just like these fajitas. In a bowl or resealable plastic bag, mix the chicken, garlic, chili powder, cumin, lime juice and a little salt and pepper. Let marinate for at least 30 minutes or overnight. Heat a cast iron (or heavy-duty) skillet over medium-high heat. Add 1 Tbsp. of the oil and heat it until it shimmers and starts to smoke. Add the onion. Cook, stirring occasionally, until the onions starts to turn brown in spots (not burnt) and softens. Add the peppers and continue cooking until they start to soften, lower heat if needed so nothing burns. Add the zucchini and season well with salt and pepper. Cook until zucchini also takes on a little color, but doesn’t get too soft. Transfer to a bowl and keep warm. Add the remaining 1 Tbsp. of oil to the pan. Heat again until shimmering. Add the chicken and the marinade. Cook until the chicken browns and the marinade has almost evaporated. Add the vegetables back to the pan and heat thoroughly. Taste and adjust seasonings if necessary. Whisk the crema with the chipotle sauce. Set aside until ready to serve. 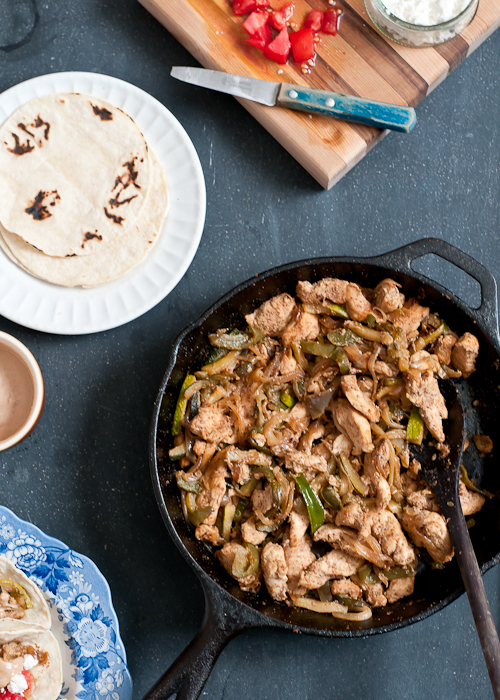 Place some of the chicken, zucchini and peppers in a warm tortilla. Drizzle with a little of the crema and top with crumbled cheese and diced tomatoes. I just stumbled upon your blog today and I’m loving it! Such great, diverse content and love your food photography. Mexican food are lots of veggie and spicy why I love it much. 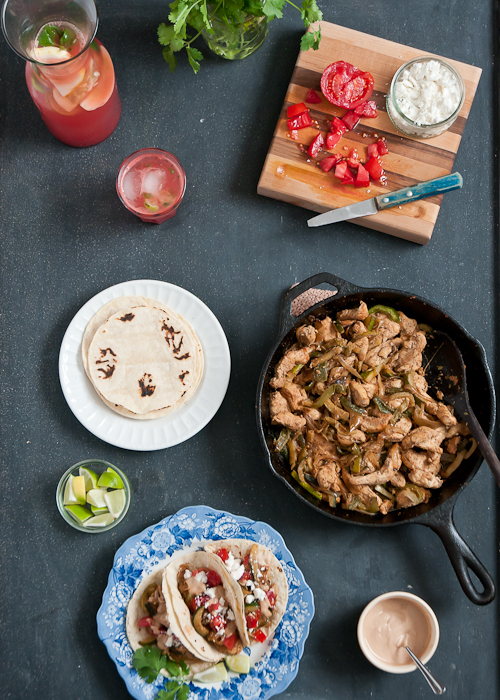 Oh dear me – those fajitas look amazing! !